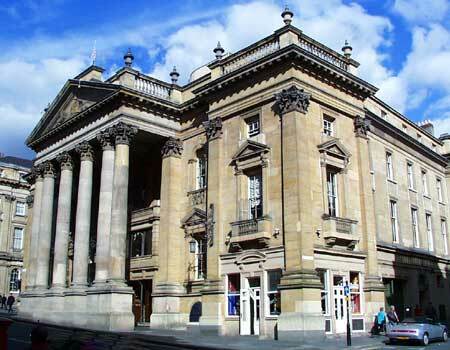 The Theatre Royal, Grey Streetn Newcastle upon Tyne. Location: Grey Street, Newcastle. Status: Listed Grade I. This is Newcastle's second Theatre Royal. The first built in brick in the Georgian style in 1788 by David Stephenson was demolished in 1836 to make way for Grainger's Grey Street who was committed to build a replacement. Its six massive Corinthian columns rise up from huge moulded plinths and support a triangular pediment surrounding the Royal Arms carved by C.J.A. Tate of Newcastle. On the 24th November 1899 a disastrous fire gutted the interior of the building. The proprietors engaged the services of the leading theatre architect of the time, Frank Matcham of London, who in 1901 gave the theatre its present Edwardian atmosphere. Matcham's interior in its turn was remodelled by Renton Howard Wood Levin Partnership, but his balconies and boxes were retained.